having the discipline to get it done & actually make progress. Understanding what to do to improve your guitar playing is quite easy. Getting it done is not always so simple. Some of the things you need to do to improve your playing require a lot of self discipline. The good news is that they make your guitar playing better very quickly. Want to seen an example? The hardest part is getting yourself to take the right actions that move you towards your goals. Playing guitar did not come easy to me when I was younger. I didn't possess any natural talent. I entered music college 4 years after finishing high school. I was an average student in high school and was very afraid of not doing well in college. I spoke to my music theory professor about my fear of not doing well in music classes and falling behind other students. His reply stunned me. He said: "Most music students never actually get their music degrees. Some fail the music classes. Others drop out and change their major to something easier. Less than 25% of students in this class will graduate with a music degree." He continued: "The best music students are not always the best musicians or the most intelligent people. They have a strong desire to master their instrument and the solid work ethic to back it up. These people virtually always make it." Intense desire for musical greatness is more than a wish. It’s an all-consuming obsession that drives your choices and actions. It's been years now since I finished college. I've reached the big musical goals I set for myself back then. I've also helped hundreds of ordinary people become extraordinary guitar players. Those who reached their musical goals the fastest were convinced about their massive musical potential. Fact: we are all born with equal potential for musical greatness. This includes YOU! The difference between great guitarists and everyone else is the amount of musical potential they converted into actual musical skills. You can do the same. You have potential to achieve far more than what you have achieved so far. Implement the tools that make you a great guitar player fast. (This is where your desire and work ethic come in!). Your guitar playing potential is virtually unlimited. However, potential alone won’t make you a great guitarist. 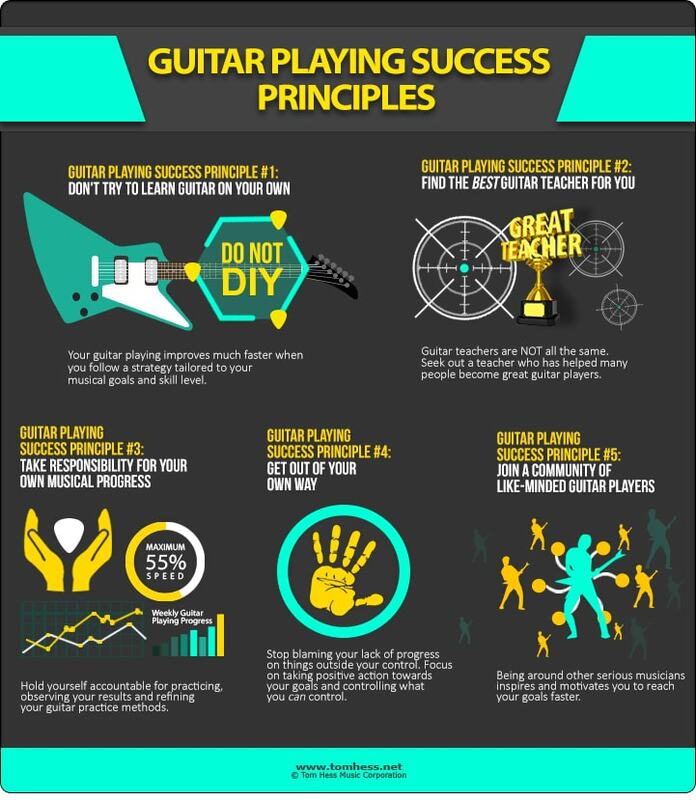 Guitar Playing Success Principle 1: Don't try to learn guitar on your own. Don’t learn guitar with random free lessons online. Your guitar playing improves much faster when you follow a strategy tailored to your musical goals and skill level. This guitar playing test tells you if you are on the right track to reaching your musical goals. Guitar Playing Success Principle 2: Find the best guitar teacher for you. Guitar teachers are NOT created equal. Every guitar teacher has different credentials, levels of experience and amount of proof of how good they are. Proof is critical. You want to study with a teacher who has helped many students become great guitar players. Expect and demand the best results from the investment of your time and money. Guitar Playing Success Principle 3: Take responsibility for your own musical progress. A great guitar teacher lays out the path towards your musical goals…but YOU must walk it. You are responsible for your musical progress, nobody else is. You must hold yourself accountable for practicing, observing your results and refining your guitar practice methods. Tracking your musical progress makes this easy. Guitar Playing Success Principle 4: Get out of your own way. Your age or finger length do NOT affect your musical progress . Your beliefs, choices and actions do. Focus on your goals and do what is required to reach them. Guitar Playing Success Principle 5: Join a community of like-minded guitar players. Being around other serious musicians inspires and motivates you to reach your goals faster. Hint: Private, members-only forums are far more likely to have committed and serious guitar players than public online forums. Implement these principles to reach your guitar playing greatness. This guitar playing test tells you how close you are to reaching your musical goals. Are you ready to become a great guitar player? Take guitar lessons with an electric guitar teacher.